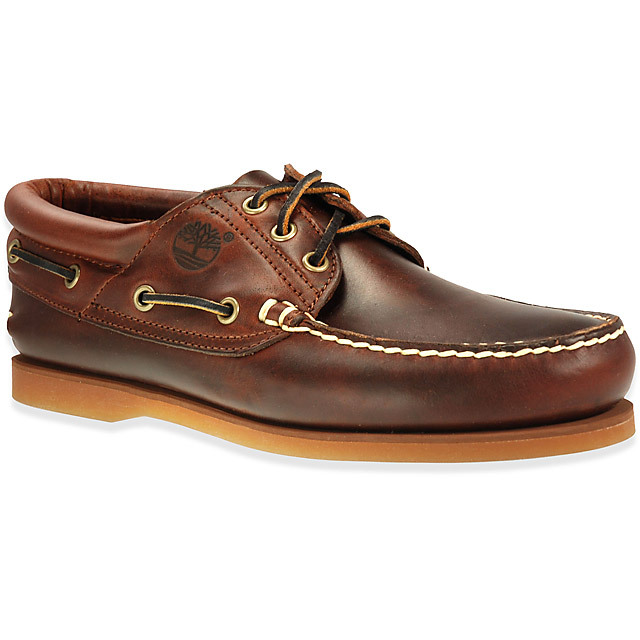 In 1985, you could buy a pair of brown Timberland 3 eye boat shoes for about $75. They were sewn together, by human hands, somewhere in New Hampshire. They were great shoes. If you were a person who actually spent time on and around boats, they were functional and durable. If you were a drunken college student, staggering across campus to that night’s keg party, they were fashionable and durable. If you were a Yankee Grandpa who walked your Jack Russel the half mile into town to get the Union Leader each morning, they were dependable and durable. I had a pair that I wore 4-5 times a week for about four years straight. By then, they were broken-in to perfection, although the razor-cut sole had worn down as smooth as the underside of a bowling shoe. Still, all the stitching remained as tight as Randolph Scott and Cary Grant. And of course, every little crease and scuff and nick in the leather had a story to tell. Like I said earlier, they were durable. I wore them a lot less after college, but even ten years after their purchase date they were still functional. It baffles me to this day where they eventually “went.” I know I would never consciously throw them way. At least I hope I wasn’t that stupid. But they disappeared at some point. I miss them! $75 in the mid-80s wasn’t outrageously expensive, but it was still pretty far above the mean most people were plunking down for footwear. This particular shoe was about the same price as the first Air Jordans, although with the Timberlands, you could sleep better at night knowing that they were made by American craftsmen being paid a fair wage and not 9 year-old Asian kids working for pennies a day while glue fumes inexorably feasted away on their brains. The point is, to buy these shoes back then was to purchase something that was worth it. Getting what you pay for, and all that. A product you could rely on, offered at a fair price. Stop me if you’ve heard this one before, but sadly, at some point in the late 80’s and early 90’s Timberland and Cole Haan and L.L. Bean and Johnston & Murphy and Sperry and dozens of other American footwear makers shifted their production overseas. This all happened within about a five year window. Monkey See, Monkey Do. What once were worthy products became disposable rubbish. If you’re really paying attention, and most people aren’t, because, why bother–there’s been a bit of a mini-revival in the Made In The USA footwear market recently. That’s all well and good, but upon closer examination, it comes up a bit short in the value department. $75 in 1985 money translates to $165 today. And yet, American-made boat shoes from Sperry and Eastland are running $300 bucks right now, or basically twice what they used to in terms of real money. Timberland, whose shoes were better than both of those brands back in the day, doesn’t even offer a domestically-produced boat shoe as far as I can tell. What was once a solid value is now a hyper-inflated fashion statement. But, hey, at least it exists.